After careful plans to observe the total lunar Eclipse of Dec 10th 2011 in the Portland city center, fog formed late, so plans to relocate were rushed at the last minutes as we drove fast from the city to the Columbia River Gorge Crown Point Oregon Vista House, yet only to find a hundred people, photographers, etc, most were ensconced in their cars with engines running, while Gorge east winds gusted to 60 mph with 25 degrees F.
So I set up my Celestron Nexstar 5i telescope anyway, huddled into the wind-shielded side of the Vista House with a few brave other photographers. I made quick mental notes of the image at medium power through the telescope and began to photograph crudely as the wind buffeted the scope and my Sony NEX5 camera poised high and teetering on its tripod over the telescope eyepiece. It was difficult at times as I began to speak as my hands froze and unable to operate the telescope or the camera, worse, many people approached then asking me if I could tell them what was happening as I appeared as the only professional with serious equipment in the grueling wind and freezing temperatures. They heard in the media and then recalled all the hoaxes of misunderstanding of the moons image as a rare visible sight setting in the west while the sun rose in the east. I had to explain the atmospheric effects of light bending through a natural lens. It was fun and although the constant fumes of diesel engines running for those who would not disembark from their warm cars, a few of us weathered the bitter cold, ironically lady friends of mine stayed until sunrise, where my professional photographer friend dressed in Alaskan outback parka and full proper clothing, refused to get out of the car. Much in post preparation was then later made in the past week at home to produce this accurate large technical documentary dry pastel sketch onto 19″ X 25″ black Strathmore pastel paper completed today, December 19th 2011. It comprises a time span of possibly an hour as the moon was also observed at speed in my Mercedes side view mirror as I drove out the I-84 highway at super-legal speeds, the earths red shadow on the moon changed fast. So the sketch is possibly at just before full totality. Then daylight began to creep up in the east just as I arrived and set up the telescope [as depicted in the reflection of the old historic gas street lamps at Crown Point. Portland’s city lights 30 miles to the west are seen under a shroud of fog. This is also rendered in the sketch and as a final artist’s conception, the still deeper reflection of the moon as an image seen in a mirror within a mirror, on the Vista House windows. I really enjoyed this sketch. 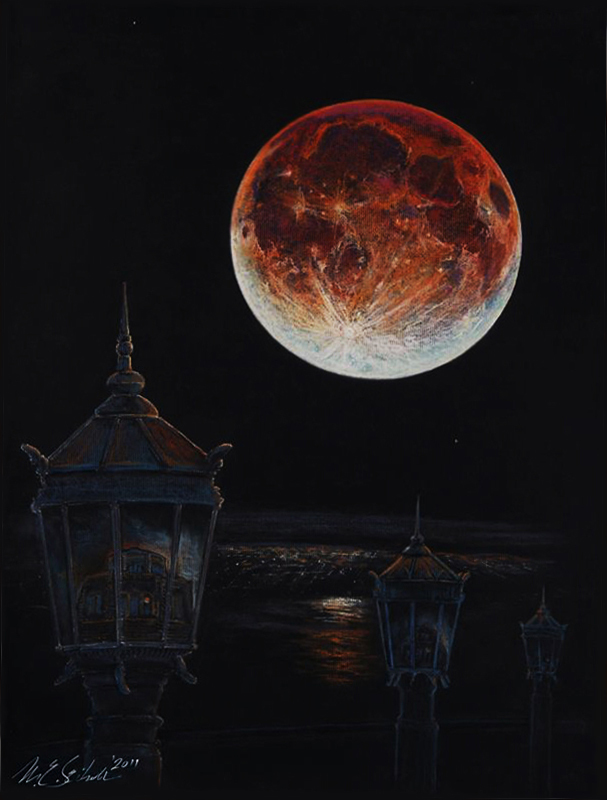 The perspective & reflections as well as the size & colors of the moon make for a lovely sketch. Great story as well! Congratulation, it’s great to mix art and astro!